(1) structural reform assistance, building on the Commission's Structural Reform Support Programme; (2) a stabilisation function; (3) a backstop for the Banking Union; and (4) a convergence instrument to give pre-accession assistance to Member States on their way to joining the euro. 1 March 2017. 4 This was further highlighted in the Reflection Paper on the future of EU finances of 28 June 2017. 5 At the current juncture, there is a window of opportunity to launch concrete forward-looking proposals on both the future of the Economic and Monetary Union and on how future EU public finances can help to respond to identified challenges. European value added is at the heart of the debate on European public finances. EU resources should be used to finance European public goods. Such goods benefit the EU as a whole and cannot be ensured efficiently by any single Member State alone. In line with the principles of subsidiarity and proportionality, the EU should take action when it offers better value for every taxpayer's euro compared to action taken at national, regional or local level alone. a whole. A more integrated and performing euro area would bring further stability and prosperity to all in the EU while ensuring that Europe's economic voice is strongly heard on the global stage. The new budgetary instruments presented in this Communication seek to tackle some of the specific needs of euro area Member States and those on their way to joining the euro, while keeping in mind their broader needs and aspirations as EU Member States. In doing so, it also seeks to maximise synergies between existing and future instruments, as they will be presented by the Commission in May 2018 as part of its proposals for the post-2020 EU Multiannual Financial Framework. EU public finances include the EU budget and several other euro area and European mechanisms and financing instruments. These contribute to Member States' economic and social development and support shared EU-level priorities (see appendix for an overview). The deepening of the Economic and Monetary Union is one these common priorities. It requires determined actions from individual Member States as well as adequate support from the EU budgetary and policy coordination instruments. This communication sets out proposals and ideas on how better to use the EU budget as a way to strengthen the resilience of our interdependent economies. Progress made by both euro and non-euro countries in implementing reforms and converging upwards will be beneficial to all. In very specific cases, the EU is empowered to borrow and lend. This is notably the case for the management for loans provided under the Balance of Payments Facility 9 to support non-euro Member States in the event of difficulties in their balance of payments. It is also the case for loans provided under the European Financial Stabilisation Mechanism. 10 Since the funds raised and the corresponding loans are back-to-back operations, there is no direct impact on the EU budget as long as recipient Member States honour their obligations. In addition to grants and loans, EU support has also increasingly taken the form of technical support. With the establishment in 2015 of the Structural Reform Support Service, the Commission expanded its technical support and is helping Member States, upon their request, to carry out reforms in key policy areas and to strengthen their public administrations. The actions supported directly by the EU budget are complemented by a number of European or euro area tools and bodies. 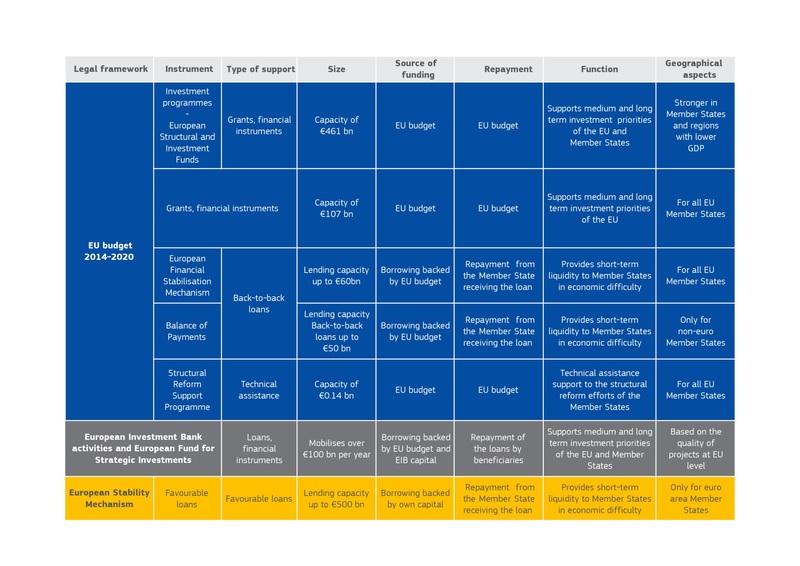 Some of these operate within the EU institutional framework but outside the EU budget, such as the European Investment Bank. Others are outside the Union legal framework, such as the European Stability Mechanism. While the European Investment Bank supports projects contributing to jobs and growth in Europe and beyond, the European Stability Mechanism provides financial assistance to euro area Member States experiencing severe financing difficulties. Source: European Commission. EFSM: European Financial Stability Mechanism. BoP: Balance of Payments. While the EU budget has always promoted upward social and economic convergence and the lending firepower available at EU level was increased in recent years to respond to extreme circumstances, macroeconomic stabilisation has not been an explicit objective of the EU budget so far. The experience of the crisis years has also shown that the architecture and scope of EU public finances do not yet fully match the specific needs of the Economic and Monetary Union – neither for the euro area Member States, nor for Member States on their way to joining the euro area. (1) To promote and support structural reforms in the Member States in order to achieve greater resilience of economic structures and better convergence in performances. This is notably the case for countries sharing the single currency but also for Member States on their way to joining the euro, as resilient structures are essential for a smooth participation in the euro area. The crisis years have clearly shown the importance of having modern economic and social structures able to respond swiftly to shocks in order to avoid aggravating economic or social distress. They have also had a sizeable impact, exacerbated in certain parts of Europe, in terms of economic output, unemployment, investment and bank bailouts. It is only now almost ten years after the crisis hit that there are signs that the longer-term process of convergence in living standards has resumed. (2) To support euro area Member States to respond better to rapidly changing economic circumstances and stabilise their economy in the event of large asymmetric shocks. As a result of the unification of monetary policy in a single currency area, macroeconomic policy instruments in the hands of participating Member States are no longer the same. While each country differs and the size and structure of the economy matter in terms of likelihood of being exposed to shocks, the crisis highlighted the limitations of means available to individual euro area Member States to absorb the impact of large asymmetric shocks, with some losing access to the markets to finance themselves. In several instances, this resulted in protracted recessions and negative spill-overs to other Member States. (3) To sever the link between sovereign debt and the situation of the banks, to reduce systemic risks and to reinforce the collective response capacity for possible major bank failures, also to prevent contagion. A backstop to enhance the capacity of the Single Resolution Fund for coping with bank resolutions was already agreed in principle in 2013. This backstop is meant to act as last-resort insurance and is important to strengthen confidence further in the European banking system. With this in mind, there are ways to develop shared budgetary instruments at EU level that can contribute to the stability of the euro area and also benefit the EU as a whole. To ensure their success and effectiveness, and to maximise their efficiency for the taxpayer, these instruments must be conceived in full synergy with other budgetary instruments existing in the broader Union framework. The modernisation of EU public finances, with proposals from the Commission to follow in May 2018, will be a unique opportunity for the EU and the euro area to equip themselves with the means that are needed. ·This Communication presents a new way to support national reforms identified in the European Semester of economic policy coordination, building on both budgetary and technical support. First steps are proposed for the period 2018-2020 in the form of targeted changes to the Common Provisions Regulation governing the European Structural and Investment Funds and a reinforcement of the current Structural Reform Support Programme. For the post-2020 Multiannual Financial Framework, the Commission intends to present a new reform delivery tool to support Member States' agreed reform commitments financially. Moreover, it will propose to strengthen technical support for the period post-2020, building on the experience of the Structural Support Reform Programme. ·This Communication proposes to set up a dedicated convergence facility for Member States on their way to joining the euro. For the period 2018-2020, the Commission proposes to establish a dedicated work stream under the Structural Reform Support Programme. For the period post-2020, this should be turned into a dedicated facility. The choice of reform priorities will be discussed and monitored as part of the European Semester. ·This Communication lays down the key features of a backstop to the Banking Union. This consists of a credit line or guarantees through the European Stability Mechanism/European Monetary Fund, to be provided directly to the Single Resolution Fund. ·This Communication presents some key features for the roll-out of a stabilisation function as a way of preserving investment levels in the event of large asymmetric shocks. The stabilisation function is conceived for the euro area Member States and should be open to the other EU Member States. This would need to be reflected in the eventual financial design. These functions are described in more detail in the subsequent sections. However, before looking at the fine print, a number of overarching principles should be kept in mind. ·Firstly, while certain functions target the more specific needs of euro area Member States on the one hand, and non-euro Member States on the other, they are all anchored in a common EU approach and a vision of the broader EU framework. A clear picture of overall EU public finances – today and tomorrow – is essential when designing these instruments: this will help reinforce the synergies between all actors and financing tools, avoid duplications and, ultimately, ensure a greater return for each euro spent collectively. This is all the more necessary since, as is recalled throughout today's package, the future of euro and non-euro Member States is closely intertwined, and the distinction between them is becoming less relevant over time. ·Secondly, while the rest of this paper looks mainly at the expenditure side of EU public finances, a modernised system of own resources could also contribute in the future. For instance, the revenue side of the EU budget already provides a certain degree of economic stabilisation, in particular through the own resource based on Gross National Income, which accounts for almost 75% of total own resources, and which reflects relative economic performance. 12 This means that just as the spending side of the EU budget has evolved over time, further improvements should also be considered on the revenue side. 13 Possible sources of further revenues were for instance identified by the High Level Group for Own Resources. 14 These considerations are not developed in this text but will be explored in view of the post-2020 Multiannual Financial Framework. They can be complementary to what is presented below. ·Thirdly, these functions should operate hand in hand with the policy framework provided for by the European Semester of economic policy coordination, including the Stability and Growth Pact. The European Semester is the main tool for the coordination of Member States' economic policies at EU level. It allows Member States to discuss their economic, social and budgetary priorities and to monitor progress at specific times throughout the year. In the context of the European Semester, the Stability and Growth Pact and the Macroeconomic Imbalances Procedure serve to ensure sound public finances and to prevent risks of imbalances. Progress has also been made in establishing a greater link between the priorities of the European Semester and the European Structural and Investment Funds, by introducing ex-ante and macroeconomic conditionalities. 15 Moreover, by making best use of the flexibility built into the existing rules of the Stability and Growth Pact, the current Commission has strengthened the link between investment, structural reforms and fiscal responsibility, while taking better account of the cyclical economic conditions faced by Member States. 16 Looking ahead, it will be essential to keep strengthening the coherence and impact of all these instruments. ·Fourthly, the four functions discussed here are closely interlinked. They can operate as part of the global approach to a modernised EU framework. Given the focus on the Economic and Monetary Union, the explanations naturally refer to the EU priorities and financing instruments linked to jobs, growth, investment and macroeconomic stability. However, this does not prejudge other elements of the Multiannual Financial Framework proposals that will follow in May 2018. For the period post-2020, it is possible to design a way forward that maximises the impact of EU public finances. This way forward is summarised in the graph below. A lot of the elements are well known: as is the case today, a number of EU funds and, in particular, the European Structural and Investment Funds will continue to exist as a vehicle for fostering real convergence, alongside other financing sources such as those provided under the "Juncker Plan" and other EU-level instruments. Irrespective of the exact funding source, support will still take one of the three basic following forms: technical assistance, grants or loans. National reform priorities will still be identified by Member States as part of their annual national programmes in the context of the European Semester of economic policy coordination. As explained in the 2018 Annual Growth Survey, 17 efforts need to continue on implementing reforms that are underway and this often takes time and discussion. This is why the Commission is advocating a more multiannual approach and a more collective review of reform commitments. Alongside national reform priorities, Member States will develop their own investment priorities, which could be reflected in a national platform of investment. These platforms would bring together relevant actors, at different levels of authority, in each Member State, in order to define multiannual investment priorities, to support pipelines of projects, which could also be part of European projects, and to identify sources of funding and support, including from the EU. While this construction is relatively similar to today's realities, two new features would be added. The first one is a reform delivery tool that would provide extra grants to support national efforts in implementing the reforms identified as priorities in the European Semester. The second one is a stabilisation function that could provide quick support and help to maintain national investment levels in the event of large asymmetric shocks, typically by filling the financing gap of pre-existing pipelines of projects and/or supporting skills upgrading. These two new features are further explained below. Appropriate national policies are essential for the smooth functioning of a more integrated Economic and Monetary Union. Since many critical policy areas that are decisive remain primarily in the hands of the Member States, their coordination and the sequencing of reforms under the European Semester is essential to maximise their effectiveness, not only at national level, but also at EU level. b) technical support for specific actions at the request of the Member States. With a view to supporting Member States in implementing the reforms identified in the context of the European Semester, the Commission intends to propose a new reform delivery tool under the post-2020 Multiannual Financial Framework. This new tool would be made available to Member States committing to reforms discussed in dialogue with the Commission and agreed in reform commitments. This new reform delivery tool would seek to support a broad range of reforms. The focus should be on those reforms that can contribute most to the resilience of domestic economies and have positive spill-over effects on other Member States. These include reforms in product and labour markets, tax reforms, the development of capital markets, reforms to improve the business environment as well as investment in human capital and public administration reforms. The reforms to be supported would be identified in multiannual reform commitment packages presented and monitored together with the National Reform Programmes. The reform commitments would be proposed by the Member States themselves and would include a set of reform measures with clear milestones and targets (see box below). Member States with excessive imbalances identified in the Macroeconomic Imbalances Procedure would be invited to present such reform commitments as a means of tackling the issues that are highlighted. A peer review process would ensure that the reform proposals benefit from the experience of other Member States as well as an assessment by the Commission. Once the reform commitment package is agreed, the monitoring and reporting on the implementation of its milestones would be aligned with the European Semester. National Reform Programmes would be the source of information on progress and should provide information on steps towards reform completion. The annual Country Reports produced by the Commission's services would provide an updated assessment of reform progress. The process for the award of support under this tool would need to be carefully calibrated to make sure the decision is timely and has sufficient ownership. For the period 2018-2020, such a system could be tested in a pilot phase by offering the possibility to Member States to use part of the performance reserve in the current European Structural and Investment Funds to support reforms instead of specific projects. To this end, amendments to the Common Provisions Regulation are presented today as part of the package. 1.Relevant structural reforms should be proposed by the Member States themselves within the context of the challenges identified in the European Semester process. 2.In a first phase, following a dialogue with the Commission, a reform commitment package would cover a number of reforms to be implemented over a three-year period at the start of the Multiannual Financial Framework programming period post-2020. 3.The agreed reform commitment packages would provide for a detailed set of measures, milestones for implementation and a calendar for completion within a maximum period of three years. Member States would report on progress together with their National Reform Programmes. 4.A second round of reform commitment packages could be agreed in the course of the programming period, for example at the request of a new government. 5.Criteria would be drawn up by the European Commission for assessing progress at the different milestones in order to help Member States with their reforms. The quantitative and qualitative targets and milestones would provide the basis for the assessment for the financial support. As a complement, the Commission is planning to enhance significantly the technical support that it offers to Member States for the design and implementation of reforms. Since the Structural Reform Support Programme was launched, the requests for support by Member States have significantly exceeded the amount of funding available for the annual cycles (see box below). 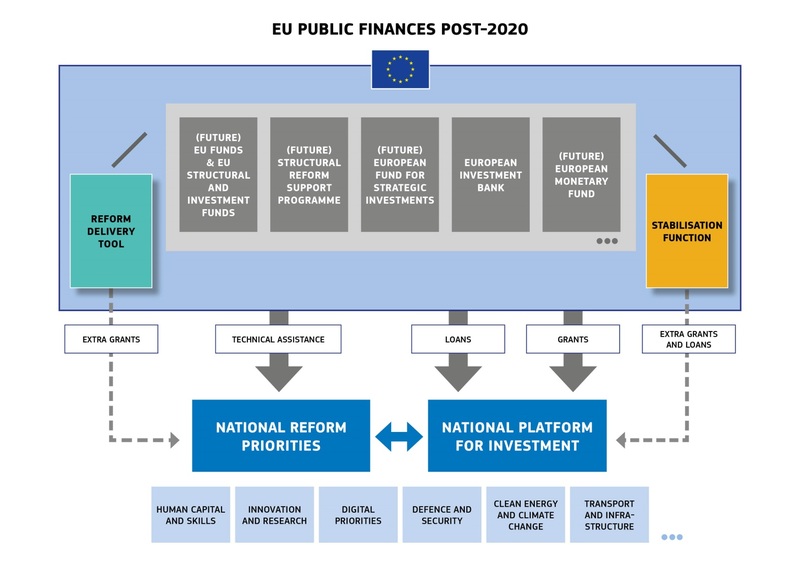 As a first step, the Commission proposes to double the financial envelope of the current Structural Reform Support Programme, thus bringing it to EUR 300 million for the period up to 2020, also to cover the needs of Member States on their way to joining the euro (see below). This would allow for the rapid deployment of additional technical support for envisaged structural reforms at the current juncture. Based on this experience, the Commission also intends to propose a follow-up programme to the Structural Reform Support Programme under the post-2020 Multiannual Financial Framework. the Council following a proposal from the Commission. Its aim is to finance tailor-made technical support to Member States to help them with their reform plans. It has a budget of EUR 142.8 million for the period from 2017 to 2020. The support is available to all EU Member States, is demand-driven and requires no co-financing. The technical support covers reforms in the areas of governance and public administration, public financial management, the business environment, labour markets, health and social services, the financial sector and access to finance. It draws on good practices and expertise from across the European Union, as well as from international organisations, the private sector and within the Commission. The programme is implemented by the Commission's Structural Reform Support Service in cooperation with other Commission services and mobilises experts from all over Europe and beyond. The Structural Reform Support Service has so far supported 15 Member States to carry out over 150 projects. Under the Structural Reform Support Programme 2018 cycle, the Structural Reform Support Service has received 444 requests for support from over 20 Member States, leading to a substantial excess demand for the Programme's limited budget. all conditions. Member States that want to join the euro must be able to do so." As foreseen in Article 140 of the Treaty on the Functioning of the EU, Member States need to have achieved a high degree of sustainable convergence in order to adopt the euro. This is assessed based on the fulfilment of the four convergence criteria listed in Article 140 and in Protocol No 13 annexed to the Union Treaties. In addition to these formal criteria, the resilience of the economic structures is also essential for the smooth transition and participation in the euro, in particular to absorb shocks. The resilience of economies depends on a number of factors. Member States should manage their budgets in accordance with the principles of sound public financial management, creating fiscal buffers in good times and ensuring a high return on public expenditure, including through well-functioning public administrations. Their regulatory and supervisory institutions should be ready to participate in the Banking Union. Properly functioning labour and product markets should allow for the rapid expansion of new activities and high levels of employment and productivity. As part of its technical assistance activities, the Commission proposes to set up a dedicated work stream to offer targeted support to Member States on their way to joining the euro. The technical support will be offered upon request and will cover all policies that can help achieve a high degree of convergence, such as support for reforms in the areas of public financial management, the business environment, the financial sector, labour and product markets, and the public administration. This technical support will be funded through the Structural Reform Support Programme. It will be fully voluntary and offered without any co-financing from the beneficiary Member States. This proposal is reflected in the amendment to the Structural Reform Support Programme Regulation presented alongside this package. 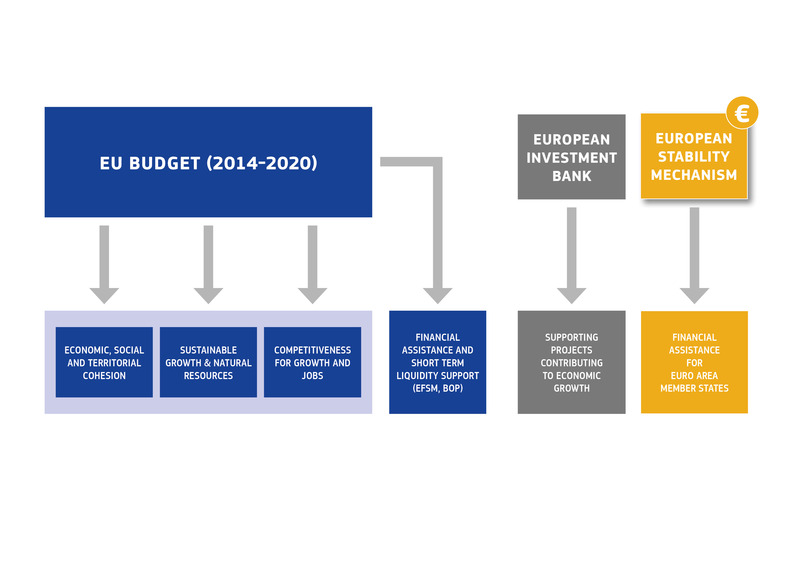 Member States concerned can also decide, already now, to reprogramme part of their technical assistance budget available under the European Structural and Investment Funds for projects to be supported by the Structural Reform Support Service. Progress with the reforms on the ground, including those linked to the reform delivery tool presented above, will continue to be monitored in the context of the European Semester. The creation of a backstop for the Single Resolution Fund was agreed by Member States in 2013, as a complement to the political agreement on the Single Resolution Mechanism Regulation. 20 As last-resort insurance in the event of a bank resolution, a common backstop would only be activated in the event that the resources available in the Single Resolution Fund were insufficient to finance the resolution of the bank(s) concerned. This would enhance confidence of all parties concerned in the actions to be taken by the Single Resolution Board. Four years on, this backstop is still not operational. The September 2017 State of the Union address and the October 2017 Communication on completing the Banking Union 21 emphasise the need for such a backstop to be made operational as a matter of priority. The Reflection Paper on the deepening of the Economic and Monetary Union identified certain criteria that the backstop should meet to be operational in the event of a crisis. It should be of adequate size to be able to fulfil its role and be able to be activated swiftly in times of crisis. It should also be fiscally neutral, given that the Single Resolution Mechanism Regulation stipulates that the banking sector in the Banking Union must reimburse any potential disbursements from the Single Resolution Fund. The Commission is today putting forward a proposal for the setting up of a European Monetary Fund, which foresees that the future European Monetary Fund should provide a credit line or guarantees directly to the Single Resolution Fund. Most Member States have expressed their support for the integration of the backstop function into the European Stability Mechanism. The Commission welcomes the technical preparatory work already carried out to this end. This is also the most pragmatic and efficient solution. The European Stability Mechanism (in the future the European Monetary Fund) would build on its experience and proven track record of tapping markets, even in a challenging environment. This arrangement should be extended as needed to include on an equal footing all members of the Banking Union. Whenever a new Member State joins the Banking Union without joining the euro area, it should provide a national parallel facility alongside the European Monetary Fund's support to the Single Resolution Fund. Appropriate governance arrangements will ensure that the legitimate interests of non-euro area Member States participating in the Banking Union are taken into account. This is foreseen in today's proposal for the creation of a European Monetary Fund. The backstop should be available at the point of time when the resolution scheme enters into force. In the event that amounts additional to those readily available in the Single Resolution Fund are needed (i.e. the backstop), the European Monetary Fund's decision-making process on the use of the backstop must be quick and predictable. It must not entail additional conditionality beyond the requirements of the Regulation on the Single Resolution Mechanism. 23 The appropriate governance arrangements therefore need to be rapid and reliable, ensuring equal treatment across the Banking Union. A stabilisation function at European level would provide the possibility to activate resources rapidly to deal with shocks that cannot be managed at the national level alone. The Five Presidents’ Report and the Reflection Paper on the deepening of the Economic and Monetary Union have set out the rationale for such an instrument and important principles have been identified, which remain valid. 24 Access to the stabilisation function would be subject to eligibility criteria and an agreed mechanism to trigger its use. The rest of this section envisages a stabilisation function intended for the euro area Member States and open to all who wish to participate. Such a stabilisation function would only complement the stabilisation role played by national budgets in the event of large asymmetric shocks. Given their central role in the economy, national budgets will continue to be the main fiscal policy instrument for Member States to adjust to changing economic circumstances. This is why Member States need to continue to build up and sustain adequate fiscal buffers, notably in good times, as foreseen by the Stability and Growth Pact. 25 In case of a downturn, Member States would first use their automatic stabilisers and discretionary fiscal policy in line with the Pact. Only if these buffers and stabilisers are not sufficient, in the case of large asymmetric shocks, should the stabilisation function at European level be triggered. Such a function would help soften the effects of asymmetric shocks and prevent the risk of negative spill-overs. The objective is to provide resources to a Member State hit by a shock that would otherwise force it to turn to the market for financing – in potentially difficult circumstances – with possible impacts on the deficit/debt position of the Member State concerned. ·Distinct from and complementary to existing instruments in the EU public finances toolbox. ·Neutral over the medium-term and not lead to permanent transfers between Member States. The stabilisation function should be constructed in such a way that all participating Member States would have the same probability to benefit and would contribute consistently. ·Contribute to sound fiscal policy and minimise moral hazard. There would be no conditionality attached to the support but there would be strict, pre-defined eligibility criteria based on sound macroeconomic policies in order to access the stabilisation function. As a general principle, only Member States that comply with the EU surveillance framework during the period preceding the large asymmetric shock should be eligible for access. This will avoid moral hazard and create an additional incentive for compliance with sound fiscal and structural policies. ·Contribute to financial stability. It should reduce the risk that a beneficiary Member State ends up needing a programme from the European Monetary Fund. ·Economically meaningful in the steady state. It should be large enough to provide real stabilisation at Member State level. Estimates suggest that to be effective in the euro area, such a function should allow for overall net payments of at least 1% of Gross Domestic Product. Moreover, to be credible, the stabilisation function needs to have sufficient resources available, even in the middle of the downturn. This could imply some form of a borrowing capacity, bearing in mind the need to ensure that the EU budget remains in balance. ·Timely and effective. For those Member States fulfilling the eligibility criteria for accessing the stabilisation function, triggering should be activated automatically and rapidly on the basis of pre-defined parameters (for example, based on a large temporary negative deviation from their unemployment or investment trend). ·Include a budget support/grant component. Relying only on a system of loans could have a limited impact, since the Member State could simply borrow in the markets or access one of the existing precautionary credit lines. On the other hand, a loan component has the merit of addressing some possible liquidity concerns without creating risks of permanent transfers. A stabilisation instrument via a system of grants could have stronger and more immediate macroeconomic effects. There are different ways of envisaging such a stabilisation function. The Commission outlined three different options in its Reflection Paper on the deepening of the Economic and Monetary Union. as infrastructure or skills development. Second, a European Unemployment Reinsurance Scheme could act as a "reinsurance fund” for national unemployment schemes. Third, a rainy day fund could accumulate funds from Member States on a regular basis and disbursements would be triggered on a pre-defined basis. These options all have their merits and can also be combined over time. What the Commission envisages here is a stabilisation function which can support investment levels at national level and which can be developed over time, starting with loans and a relatively limited grant component. This would be in line with the importance this Commission attributes to investment as a driver of long-term growth, and would allow for a swifter roll-out in comparison to the two other options. Given the architecture and composition of the EU budget (annual balance and limitation on own resources), a stabilisation function would have to be constructed in such a way that it can reach its full potential over a certain period of time, notably to reach the necessary financial firepower. In this construction, a dedicated vehicle managed by the Commission could bring together different sources of funding at European level in an efficient way to provide the stabilisation function. 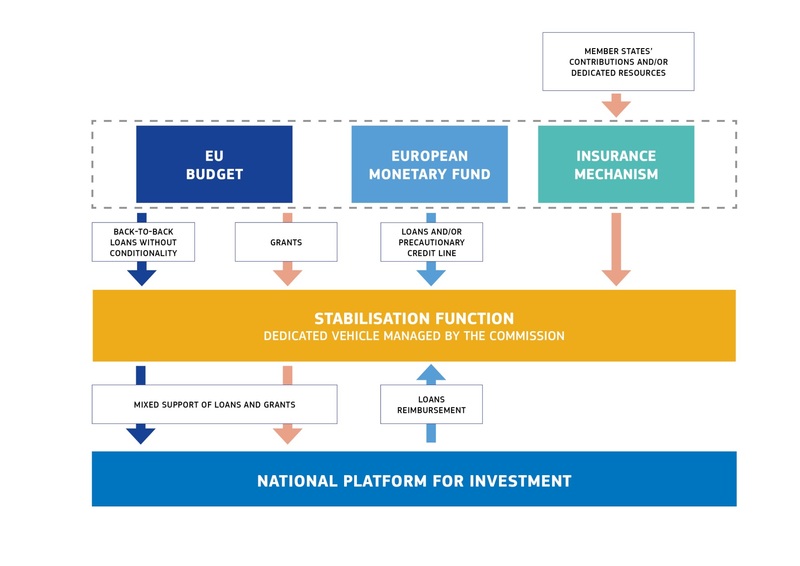 This vehicle would be based on the logic of a European Investment Protection Scheme and would aim to support well-identified priorities and already planned projects or activities at national level, such as those identified in the context of the national investment platforms mentioned above. Financial Framework 28 ).The beneficiary Member State would reimburse those loans to the stabilisation function. ·An insurance mechanism based on voluntary Member States' contributions could complement the grant support of the stabilisation function over time. Member States could contribute annually to this dedicated fund outside the EU budget and/or could agree on setting up a dedicated work stream of resources. Once Member States have committed to contribute and sufficient resources are accumulated, this mechanism would reinforce the capacity of the stabilisation function. The Commission will continue to assess the further implications for the EU budget in the context of the preparation of the post-2020 Multiannual Financial Framework and will make the necessary proposals. With this Communication, the Commission presents ideas for new budgetary instruments for a stable euro area within the Union framework. ·To ensure a swift agreement, by mid-2018, and operationalisation, by 2019, of a backstop function to the Single Resolution Fund. This proposal is contained in the proposal for the establishment of a European Monetary Fund in the Union framework. ·To strengthen the activities of the Structural Reform Support Service in order to support reforms in all Member States, and to put in place a dedicated work stream for Member States on their way to joining the euro. This is reflected in the proposal to amend the Structural Reform Support Programme Regulation, with the objective of doubling the budget available for the activities of the Structural Reform Support Service for the period up to 2020. ·To extend the possibility to use the current performance reserve in the European Structural and Investment Funds in support of structural reforms, as a way to test the idea of a reform delivery tool in a pilot phase. This is reflected in a targeted change to the Common Provisions Regulation covering the European Structural and Investment Funds. ·A reform delivery tool to support Member States' reform commitments. ·Further technical support for specific actions at the request of the Member States. ·A dedicated convergence facility for Member States on their way to joining the euro. ·A stabilisation function for euro area Member States and open to all, in the event of large asymmetric shocks. (1) COM (2017) 821, 6 December 2017. (2) Completing Europe's Economic and Monetary Union, Report by Jean-Claude Juncker, in close cooperation with Donald Tusk, Jeroen Dijsselbloem, Mario Draghi and Martin Schulz, 22 June 2015. (3) COM (2017) 291, 31 May 2017. (4) COM (2017) 2025, 1 March 2017. (5) COM (2017) 358, 28 June 2017. On 15 July 2015, the Commission presented the Communication "A new start for jobs and growth in Greece" (COM (2015) 400) and proposed a series of exceptional measures which helped to maximise the absorption of EU funds in support of the Greek real economy. Other such mechanisms include the Youth Employment Initiative, which provides support to Member States and regions facing high youth unemployment; the European Union Solidarity Fund, which provides financial assistance to Member States/regions affected by major disasters; and the European Globalisation Adjustment Fund, which provides support to people losing their jobs as a result of major structural changes in world trade patterns or as a result of a global economic and financial crisis. By the end of November 2017, the deals approved under the European Fund for Strategic Investments (EFSI) amount to EUR 49.6 billion in financing and are located in all 28 Member States, with the European Fund for Strategic Investments expected to trigger EUR 251.6 billion in investments overall. Around 528,000 small and medium-sized companies (SMEs) are expected to benefit from improved access to finance. (9) Council Regulation (EC) No 332/2002 of 18 February establishing a facility providing medium-term financial assistance for Member States' balances of payments (OJ L 53, 23 February 2002, p.1). (10) The European Financial Stabilisation Mechanism was set up on 11 May 2010 on the basis of Council Regulation (EU) No 407/2010 of 11 May 2010 (OJ L 118, 12 May 2010, p.1). It functions in a similar way as the balance of payments facility but is available to all Member States, i.e. including euro area Member States. (11) COM (2017) 821, 6 December 2017. (12) The fact that these contributions are based on the Gross National Income of each Member State means that their absolute amount changes over time depending on the economic cycle, all other things being equal. (13) Unlike national budgets, the EU budget cannot incur debt, as its revenue and expenditure must be in annual balance. Instead, it relies on financing through "own resources" There are three main types of own resources today: contributions from Member States based on their income level measured by Gross National Income, contributions based on Value Added Tax, and customs duties collected at the external borders of the Union. (14) See the Reflection Paper on the future of EU finances of 28 June 2017, which also took inspiration from the final report and recommendations of the High Level Group on Own Resources December 2016. This Group was chaired by former Italian Prime Minister and EU Commissioner Mario Monti and was composed of members designated by the European Parliament, the Council and the European Commission. (15) See also Article 4 of the Common Provisions Regulation (EU) No 1303/2013 of the European Parliament and of the Council of 17 December 2013. (16) COM (2015) 12, 13 January 2015. (17) COM(2017) 690, 22 November 2017. (18) In Declaration 52 annexed to the Treaty of Lisbon, 16 Member States (Belgium, Bulgaria, Germany, Greece, Spain, Italy, Cyprus, Lithuania, Luxembourg, Hungary, Malta, Austria, Portugal, Romania, Slovenia and Slovakia) declared that for them the "euro as the currency of the European Union" would continue as a symbol to express the sense of community of the people in the European Union and their allegiance to it. By means of a parliamentary resolution of 27 November 2017 of the French National Assembly, France has taken steps to adhere to that declaration. (19) According to Article 140 of the Treaty on the Functioning of the EU, the Commission and the European Central Bank present a report at least every two years. The next reports are expected in May 2018. Statement of Eurogroup and Economic and Financial Affairs Council Ministers on the Single Regulation Mechanism backstop, 18 December 2013. COM(2017) 592, 11 October 2017. Article18 of the Single Resolution Mechanism Regulation. (23) Regulation (EU) No 806/2014 of the European Parliament and of the Council of 15 July 2014 establishing uniform rules and a uniform procedure for the resolution of credit institutions and certain investment firms in the framework of a Single Resolution Mechanism and a Single Resolution Fund and amending Regulation (EU) No 1093/2010; see Article 18. (24) A number of guiding principles were mentioned. A stabilisation instrument should i) minimise moral hazard and not lead to permanent transfers, ii) be strictly conditional on clear criteria and continuous sound policies, in particular those leading to more convergence within the euro area, iii) be developed within the EU legal framework, iv) be open and transparent vis-à-vis all EU Member States, and v) not duplicate the role of the European Stability Mechanism – the future European Monetary Fund – as crisis management tool. In recent years, the Stability and Growth Pact has been reinforced to take account of what makes sense for a given Member State at the particular juncture of its economic cycle, for instance to avoid being contractionary when the circumstances call for the reverse. The Stability and Growth Pact provides for additional buffers in good times and the necessity for a smaller fiscal effort to be undertaken during difficult economic conditions. (26) See footnote 7 in particular for examples of existing EU instruments designed to smoothen and/or absorb shocks. (27) Such exceptional measures were taken to support Greece in recent years. Modulating co-financing rates could have a one-off stabilisation effect as it would help to keep afloat public investment which otherwise the Member States may be unable to finance. Adjusting pre-financing level could for instance mean advancing payments from the European Structural and Investment Funds agreed for the whole Multiannual Financial Framework period, subject to lower payments later on. (28) It has to be noted that an increase of the own resources ceiling could be necessary, depending on the amount envisaged. (29) The own resources decision and the Multiannual Financial Framework Regulation would have to be adjusted accordingly.